Energi-ZING Shakes are sold by Nutrisystem for use along with their Fast 5 Program. This is a five day meal replacement diet program designed to jumpstart weight loss with a promise of 5 pounds in 5 days. 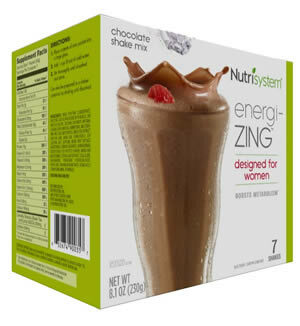 Energi-ZING Shakes are sold in several different flavors and Nutrisystem has shakes formulated for both men and women. One Energi-ZING shake is equal to 2.5 Red Bull energy drinks! For dieters who are also consuming caffeine from other sources such as coffee or tea, Energi-ZING Shakes could push them over the daily caffeine safe limit. Consumers should be aware of how much caffeine they are consuming in addition to these 200mg shakes. Energi-ZING Shakes aren't suitable for women who are pregnant or nursing nor for those with certain medical conditions. Learn More About Nutrisystem Fast Five Here. WHEY PROTEIN CONCENTRATE, FRUCTOSE, COCOA (PROCESSED WITH ALKALI), SOY PROTEIN ISOLATE, CALCIUM CASEINATE, NATURAL FLAVORS, SUNFLOWER OIL, NONFAT MILK, MALTODEXTRIN, MILK CALCIUM COMPLEX, GREEN TEA EXTRACT, XANTHAN GUM, GUAR GUM, CORNSTARCH, SOY LECITHIN, SALT, CAFFEINE, MONK FRUIT EXTRACT (SWEETENER), SODIUM CASEINATE, CARRAGEENAN, TOCOPHEROLS (TO PROTECT FLAVOR), MONO AND DIGLYCERIDES, STEVIA LEAF EXTRACT, CELLULOSE, NIACINAMIDE, PYRIDOXINE HYDROCHLORIDE, RIBOFLAVIN, THIAMIN MONONITRATE, VITAMIN B12 (CYANOCOBALAMIN), VITAMIN D3. CONTAINS MILK AND SOY. Sugar content: 8 grams (per 8 ounces). How Does Energi-ZING Shake by Nutrisystem Compare? Energi-ZING Shake by Nutrisystem contains 25.00 mgs of caffeine per fluid ounce (84.54mg/100 ml).